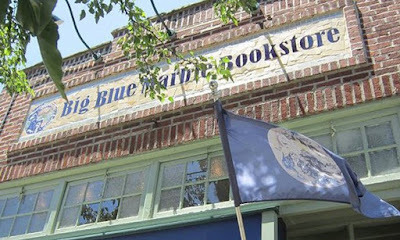 Big Blue Marble is a lesbian-owned (and often lesbian-staffed) general interest store with a feminist, progressive slant. They specialise in children’s books, literary fiction, sci-fi, poetry, and YA, with strong showings in African-American non-fiction, history, contemporary politics and cookbooks. The core of Big Blue Marble Bookstore’s mission is to serve its diverse neighbourhood. In every part of their business, from the books they stock to the events they plan, they seek to represent the diversity of their neighbours. We host events and discussions that are urgent for our community and provide experts and activists who help customers understand complex issues. While we have plenty of readings of fiction and poetry, we also have authors, teachers, and leaders talking about the most important topics in our community: Palestine/Israel, global climate change, Syria, the school-to-prison pipeline, and the history of how black artists used plays about lynching to support and strengthen black communities during decades of terror – to name topics from just the last few months. I had two events for my last book Feminism at Philadelphia at Big Blue Marble and am really looking forward to an event for my new book Green Shoots of Democracy in the Philadelphia Democratic Party, on September 18! We are so fortunate to have a real bookstore in our neighborhood. Yes, maybe we might save money by buying books online and in big box stores but so much expertise and personal attention to the customer is lost. We are losing too many small shops. Recently Len Lear wrote an article in the Chestnut Hill Local about the loss of our local camera store. Lear’s article really hit home. My husband and I bought a camera in July and decided not to go a big box store; we were wiling to pay a little more because we wanted someone we could talk to. Unfortunately when we had a problem with the camera, it was too late--the store closed in August. Given changes in technology—all those cameras in our smartphones—the demise of the camera shop was probably inevitable. The end of the neighborhood bookstore is not inevitable. If we are fortunate enough to have one these stores in our neighborhood, we can patronize them. Instead of ordering our books on Amazon—and I plead guilty here—we can order them though our neighborhood bookstore and keep that store in business.